Here in the Washington DC and Baltimore metro area, winter can spoil your enjoyment of your home’s outdoor-living spaces. 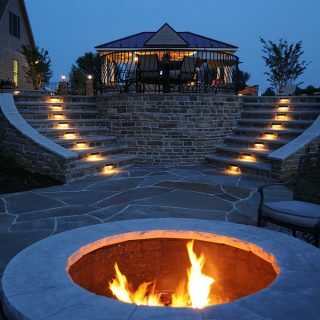 However, with help from Clearwater Landscape & Nursery’s experienced team of designers and masonry installers, you can enjoy the warmth and beauty of fire in style and safety when the weather turns cold. Picture your family and friends cozy beside a custom outdoor fireplace or firepit on a cold night when others are stuck inside. We’ll make it a reality, and you’ll experience year-round enjoyment of your back yard. Custom outdoor fireplaces have exploded in popularity in recent years, and it’s easy to see why. They can be constructed from any natural or engineered stone, brick, or concrete paver product to match any aesthetic style. A high-quality outdoor fireplace also adds noticeable value to a residential property, providing a unique and exciting selling point. Plus, they allow you to build a large, roaring fire safely, keeping you warm on cold winter nights. 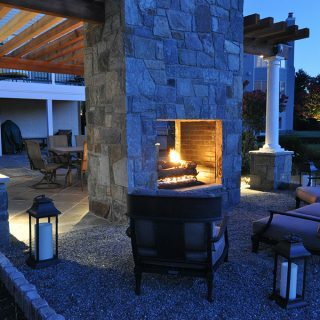 Whether you want a traditional wood-burning outdoor fireplace or modern gas logs, Clearwater is your builder of choice. Clearwater is also capable of designing and constructing custom fire pit of all sizes, shapes, and materials. With a fire pit, you can safely enjoy the rustic camping experience of an on-ground bonfire without leaving the comfort and security of your back yard. We have experience building many different types of wood and gas-burning fire pits, and we excel in designing them to integrate seamlessly with full hardscapes for a cohesive look. 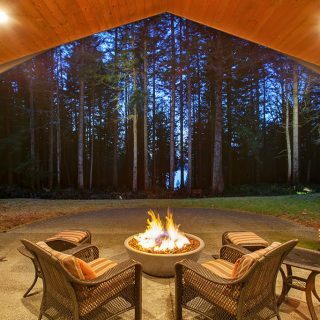 Just ask our team about all of your options for custom fire pits and you’ll be pulling up a chair to roast marshmallows in no time. Fire urns are another hot trend in outdoor-living spaces, and their possibility for styles, sizes, shapes, and applications are virtually endless. With fire urns, natural gas fuels the primal beauty of a large, flickering open flame erupting from the top of a planter, bird bath, or other large piece of pottery. Clearwater has access to many varieties of high-quality fire urns, and we can also custom build them as integrated parts of your hardscape. Our fire urns make beautiful, striking accent pieces that are perfect by the pool or lighting the corners of your patio. Check out our gallery or visit our outdoor-living showcase today to learn more about all of our fire feature possibilities. With nearly three decades of experience, the Clearwater Team has designed and installed a broad range of custom fire features in our region. Please click below to view our photo gallery of outdoor fireplaces, firepits, and fire urns to learn more.